Happy Independence Day, Americans! Let’s celebrate with some star-spangled sweets. These patriotic whoopie pies take a classic red velvet recipe and add a bit of a twist, using both red and blue food coloring for red, white, and blue treats. 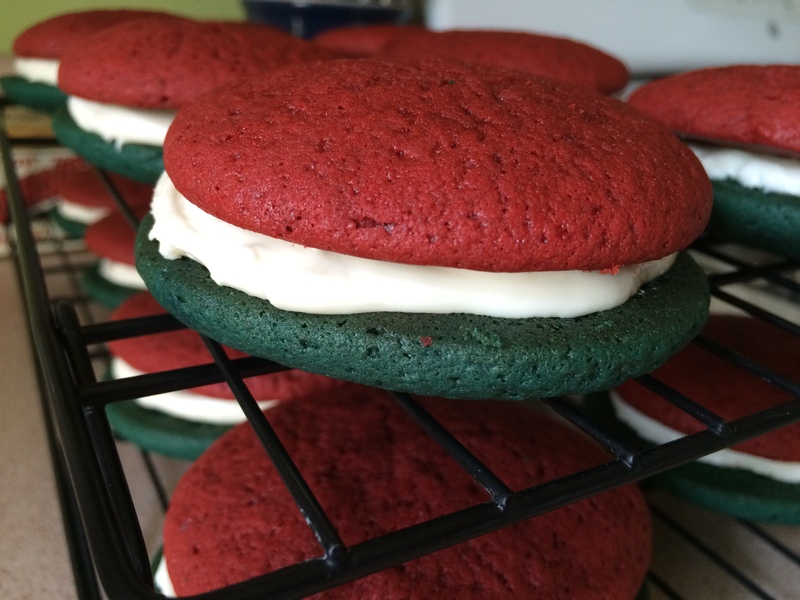 The Brown Eyed Baker (another Pittsburgh-based, self-taught baker and blogger) has a great recipe for red velvet whoopie pies, which I used as the base for these treats. Instead of adding the food coloring with the vanilla during mixing, I made the batter first without any food coloring, then divided it and tinted half red and half blue. I also chose a marshmallow creme-based filling, instead of the original recipe’s cream cheese filling so I didn’t need to refrigerate them. In a large bowl, combine flour, cocoa powder, baking powder, baking soda, and salt; set aside. In a mixing bowl, cream butter, shortening, brown sugar, and white sugar until very light and fluffy, about 5 minutes, scraping the sides of the bowl a few times. Add eggs, one at a time, mixing well after each. Add vanilla extract and beat until combined. Add the flour and buttermilk alternatively in two batches, beating until just combined after each. Divide batter into two bowls; you’ll have about 3 1/2 cups of batter in each. Add red food coloring to the first bowl and mix until well-combined; add blue food coloring to the second bowl and mix until very well-combined. Using a two-inch cookie scoop, drop scoops of batter at least 2 inches apart onto prepared baking sheets; you’ll have 6 cookies per sheet. Bake for 10-11 minutes, until tops spring back just slightly when touched. Remove from oven and cool on baking sheets for 5 minutes, then remove to wire racks to cool completely before filling. To make the filling, place butter in a mixing bowl fitted with a paddle attachment and beat on medium speed for 1-2 minutes. Add marshmallow creme and vanilla and beat until very well-combined. Add powdered sugar about 1 cup at a time, beating well between each addition and scraping the sides of your bowl frequently. You want a firm but spreadable consistency so that your filling doesn’t ooze out the sides. Flip cookies over and match up one blue and one red per whoopie pie. Using a 1-inch cookie scoop, drop generous scoops of filling onto each blue cookie. Using a small offset spatula, spread filling slightly, then place a red cookie on top. Wrap each whoopie pie in plastic wrap for easy serving and storage. Since they are so large, it’s nice to be able to eat half of one and save the other half for later.